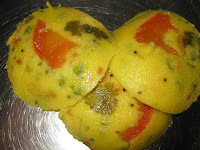 Hope ur daughter gets well soon..rawa idly looks very colourful and beautiful..
a must-make on my list now. i know it gets tough when kid is not doin good..hope ur daughter has recovered?? btw idli looks super cool and thanks for sharing awards.. Very nice recipe, never added veggies to rawa idly. Great idea! Hope your daughter is feeling better now Vidhya. Idlis look soft and fluffy.